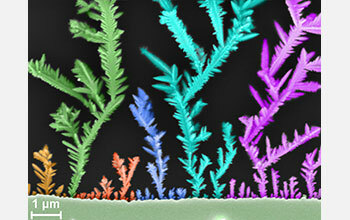 Gold nanowires, about as tall as a human red blood cell is wide. 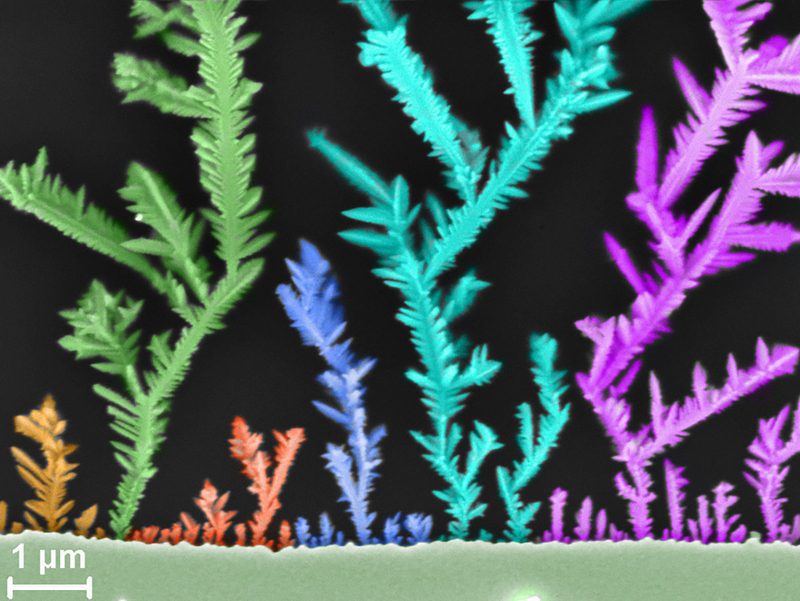 The image, captured by a scanning electron microscope and colorized using Adobe Photoshop, was taken as the nanowires grew on silicon at room temperature. Perfecting such fabrication techniques will allow researchers to enhance silicon-based electronics to increase their speed and robustness. It will also advance their use as sensors to monitor blood sugar and pressure, and to detect DNA. Researcher Adnan Korkmaz of the Center for High-rate Nanomanufacturing (CHN) at Northeastern University won "best artwork" for this picture in the "Engineering As Art" contest held by the university's Department of Mechanical and Industrial Engineering, Dec. 14, 2015.